PubliGroupe, the Swiss-based vendor of marketing, media-sales and technology services, and MediaMath, the leading provider of digital-media trading technology and services, have formed Spree7, a European joint-venture company headquartered in Berlin. DeSilva+Phillips acted as PubliGroup’s sole strategic and financial advisor on the deal. 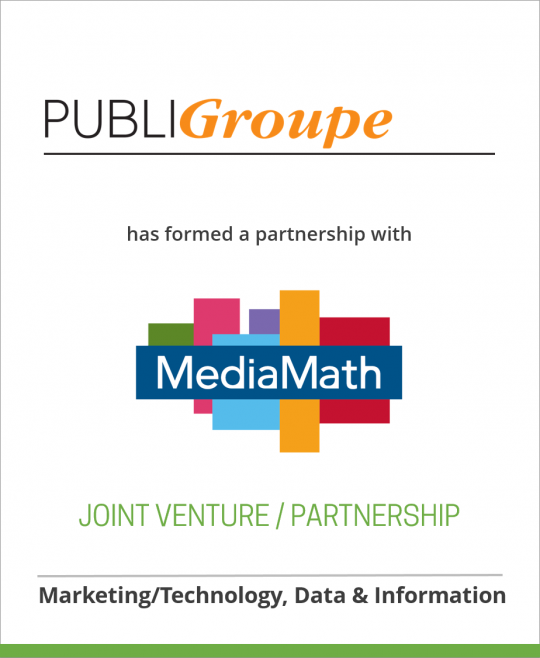 Headquartered in New York, MediaMath was founded in 2007 and is the leader in the demand-side platform (DSP) category. The company buys billions of highly targeted ads per month on behalf of dozens of top-tier agencies including all of the major agency holding companies. Major brands include American Express, Kellogg’s, Prudential and Kayak. The MediaMath buying platform, TerminalOne, provides advertising agencies and brands with the technology and back office services to trade effectively across all leading digital advertising channels. It includes a common interface and workflow, a data management layer that integrates marketer and third-party data, sophisticated algorithms and bid optimisation, and deep integrations with thousands of premium publishers and supply aggregators. MediaMath is a global company with additional offices in London, Boston, Chicago, Los Angeles and San Francisco. For more information visit www.mediamath.com. PubliGroupe is a leading Swiss-based provider of marketing and media sales services, enabling advertisers to effectively reach their audience by optimising the return of their marketing spending and allowing media owners to effectively monetise their reach. It is a performance-oriented full-service provider, employing state-of-the-art data processing tools and information technology with the ultimate goal of making marketing processes more effective for its clients, be it in traditional or digital media. The company is organised into three client-oriented business segments: ‘Media Sales’, ‘Search & Find’ and ‘Digital & Marketing Services’. Each segment is responsible for its own profits and long-term performance. The holding company PubliGroupe is listed on the Swiss stock exchange SIX (PUBN). For more information visit www.publigroupe.com.